Presented in Miami during Art Basel 2015, Antonio Aricò's latest collection ‘Still Alive' deals with the artistic and timeless theme of the ‘Still Life'. For this new collection specially designed for Seletti, Antonio wanted to play with inanimate objects and natural shapes usually put together by painters. The Two years process gave to the product a high and top notched quality that makes it so special and unique. Amongst big names such as Studio Job, Still Alive and Antonio Arico is proud to be part of the new Seletti catalogue. ‘Still Alive', a ‘practical and organized piece of art', comes from Stefano Seletti's desire to work on wooden boxes that can be used for storage. Antonio decided to use a “graceful detournement” and moved objects from one context to another by simply transforming common products and their uses to create new stories and feelings - always referring to pure and simple emotions. The result? An arrangement and combination of elements that you can use and play with. By juxtaposing their various shapes and shadows, the user receives a daily invitation to discover and explore them in a creative way. 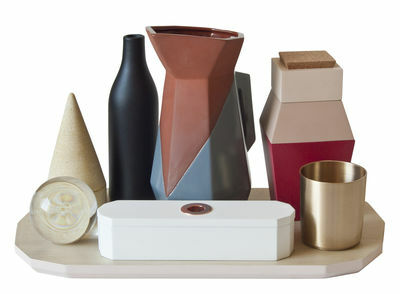 The design set includes a tall terracotta pitcher, which can be used to hold rulers or scissors, a wooden vase which is divided into three parts for storing items like tacks and paperclips, a practical cup made of brass which can be used as a pen holder, a wooden pencil box to hide your precious, favourite pens, a porcelain bottle which can be seen as a simple mono vase to put a smiling flower in, a celadon resin pyramid-shaped box to put your personal treasures in, and a magical magnifying glass sphere to help you read the passionate letters of your lover. All of these elements are highly functional, so ‘Still Alive' will become part of your daily routine - ready to be used on your desk or living room table. Sensorial, tactile, and dynamic, every piece has its own carved-out place on a polygonal wooden base and you'll have the freedom and pleasure to move them around, tidying up or playing with their various functions and materials.